from prawns to chicken and even desserts. I was convinced my grandmother’s arroz doce was the best I had ever had and that no one could make it any better. 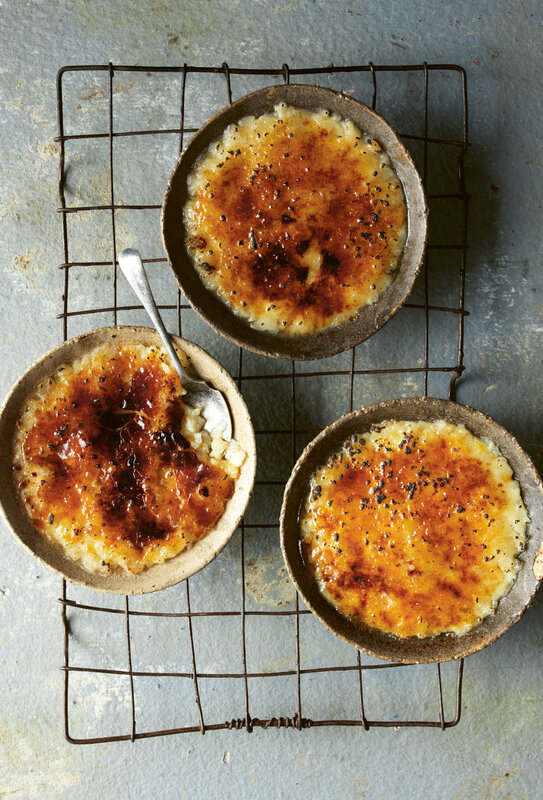 That was until Coco took an old family favourite and added an element of my favourite dessert: a crème brûlée. Bring the water and milk to a boil, along with the lemon rind and salt, on medium high. Add the rice and stir. Then turn the heat down to just above the lowest setting, and cover the pot, but stir occasionally. Most of the liquid should have evaporated after 20–25 minutes, but remember to test the rice to see that it is tender. Once the rice is cooked, add the sugar and stir. The mixture will become a little more liquid again, but continue cooking on low for another 5–10 minutes, stirring more frequently. Once most of the liquid has once again been absorbed into the rice, add the egg yolk, stirring vigorously. Pour into individual ramekins and allow to cool completely in the fridge. Before serving, sprinkle with cinnamon sugar and then brûlée.